Just days before the iPhone 5 is set to go on sale in China, the nation's second largest carrier announced on Monday that preorders for the device have reached over 300,000 units less than a week after initiating reservations. In a post to its official Sina Weibo microblog (via MacWorld), China Unicom said pre-sale orders for Apple's newest handset now stand at over 300,000, meaning the telecom added some 200,000 reservations to the 100,000 recorded a day after reservations went live. The 16 GB is the predominant favorite among preorder customers with 85 percent opting for the most economical model, while the 32 GB and 64 GB versions accounted for 12 percent and 3 percent, respectively. Distribution of orders saw Beijing racking up the most orders, followed by Guangdong, Shandong, Shanghai and Liaoning. A further breakdown of orders shows some 74 percent of reservations come from males, with the provider suggesting that many will be given as gifts to girlfriends. As for purchases by age, the 20-year old to 30-year old demographic accounts for the bulk of preorders with 52 percent, followed by those aged 30-years old to 40-years old with 34 percent. 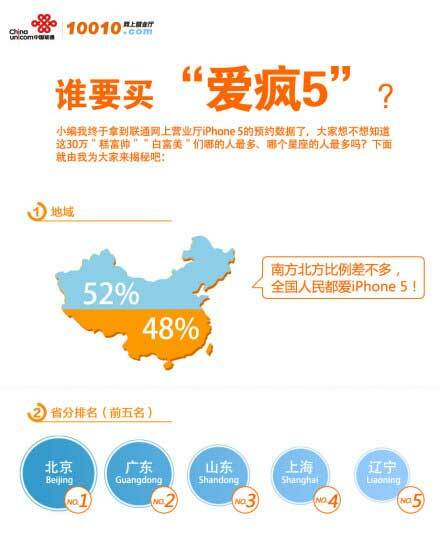 China Unicom is Apple's largest partner carrier in the country, with China Telecom coming in second. Both telecoms are readying to start sales on Dec. 14 as part of the fastest rollout in Apple's history.